Monster cookies. What’s not to love? 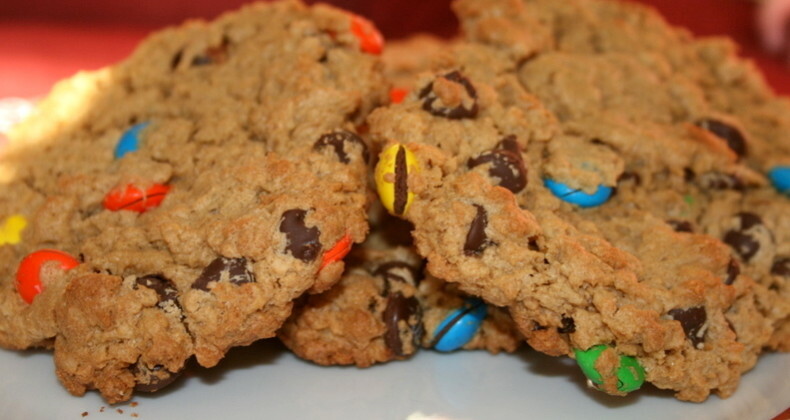 Oatmeal, peanut butter, chocolate chips and M&Ms baked into a ginormous thin and chewy cookie, sounds like love in cookie form to me. I made a batch for my friend Michelle’s 25th birthday. I know how much she loves these cookies, and I knew she would love receiving a package of them in the mail. This recipe isn’t difficult. I am going to blame Michelle’s failed attempt on the crappy, ancient, unmaintained stove, in the crappy high-priced rented apartment she was living in at the time. Now that she has a nice home of her own, I am sure she can whip up a batch without any problems. This recipe is for you Michelle. CHECK OUT THE UPDATED VERSION OF THESE COOKIES HERE! Check out Cookie Madness for tons of baked goodies baked daily! This cookie is one of the BEST I have had in awhile. My oven temp is messed up so had to cook a little longer to ensure doneness but even the gooey, half done ones were awesome! Your g-gma makes one mean cookie.